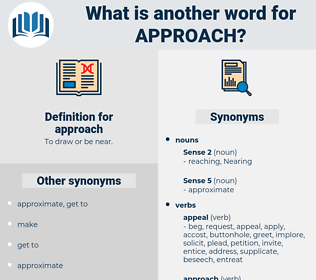 What is another word for approach? To draw or be near. catch up with or to. Measures, issues, requirements, looms, SDS, perspective, perspectives. representations, endeavours, Focuses, Visions, moves, Tracks, perspectives. data, audits, GIS, path, standpoint, logic, posture, measure, spirit, thinking, behavior, perspective, reasoning, prospect, thrust, proposal. planned, employed, Allowed, Obtained, done, built. Grips, Addresses, approximate, tackle, broach. methods, tactic, mindset, demarche, angle, perception. overlook, pass by, elude, cut, shun, pass, ignore. decrease, distance, retreat, depart, go away, stop, leave, avoid, retrogress, go, miss. He watched the hut, without the courage to approach it. The Princess who had nothing in her head but the Duc de Guise, was so irritated by this approach that she treated the Comte much worse than she had done on the first occasion when he had declared his love for her. 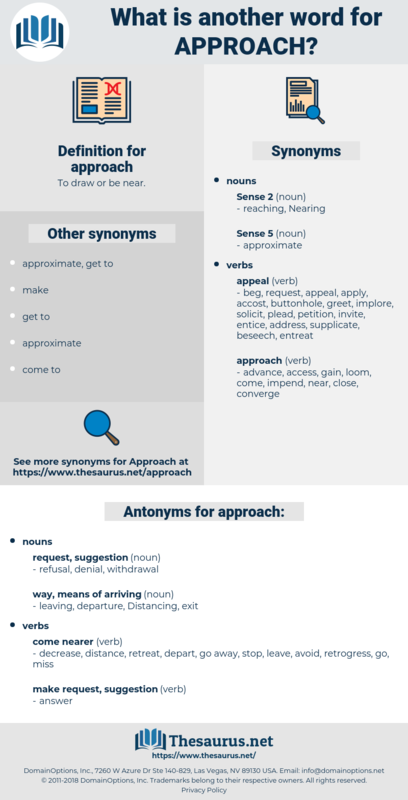 aphriza, affairs, avaricious, aphaeresis, apercu, apheresis, afro-wig, apraxia, africa, aphorise, apprise, averse, abrase, apprize, Auberge, apraxic, appraise, abruzzi, average, abrachia, abroach, aphorize, avarice, apivorous, Averroes, afresh. bear down upon, drive up, crowd, bear down on, push, close, edge in, edge up. address, accost, come up to.